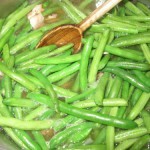 Cooked slowly in a mixture of bacon-onion water makes for the perfectly stewed fresh green bean. Pair them with most any meat. In a large pot, place the bacon and cook over medium heat for 12 minutes; add the sliced onion, cover and cook for 10 minutes. Add water, sugar, salt & pepper – bring to a boil, cover and simmer for 15 minutes stirring once in a while. 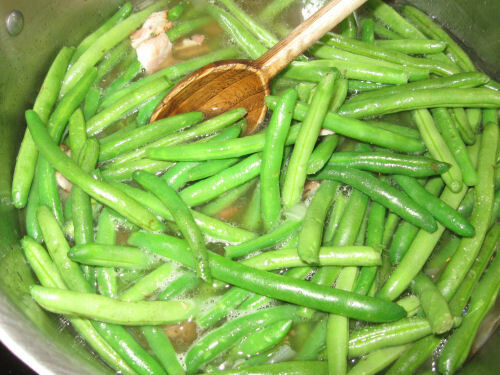 Add the green beans, raise heat to bring to a boil, reduce to simmmer and cook covered for 1 1/2 hours, stirring occassionally.